It turns out that I own a good stack of guideline publications for what was America's first news talk show,1 "America's Town Meeting of the Air", produced by the Town Hall Advisory board between 1935 and 1956.2 It was a weekly show, and in general--at least for the 90 examples I have for the 1938-1941 period--each broadcast came with a three-sheet guideline for the listeners on the subject of the weekly topic. The first sheet was a general statement of the show's interest--for example, "What Shall We Do With the Joads? ", for March 7, 1940 (the Joads being the family in the Steinbeck mega-epic The Grapes of Wrath). These intro pages are usually very concise, very well written, logical, and provocative. The third sheet was a "Who's Who" of the speakers for the show. In this case, they included Rexford Tugwell (an economist and former Director of the Resettlement Administration); Hugh Bennett (Chief, U.S. Soil Conservation Service); Carey McWilliams (the author of Factories in the Fields and at the time Chief, Division of Immigration and Housing for the state of California); and Philip Bancroft (a member of the executive committee of the Associated Farmers of California, the farmers of that state being a particular target of Steinbeck's in The Grapes of Wrath). There were serious people. And this was a serious radio show. Each week six pages of tight typescript on 11x8.5" sheets would be sent out, and each we the shows were of similar quality...just very impressive stuff. The are other ads to follow, images depicting great speed...though it strikes me that these sorts of displays come a little late in the history of the depiction of speed, especially given the experimentation in the art world with space and time. I'll have a look at earlier volumes to see if I can determine when the ads began to appear, though it seems to my intuition and deep memory that 1922 is actually "early". This gorgeous, near-dadist image belongs to Niccola Zabaglia, who published it in his book Castelli, e ponti di maestro Niccola Zabaglia con alcune ingegnose practice, e con la descriziojne del trasporto dell’obelsico Vaticano, e di altri del cav. 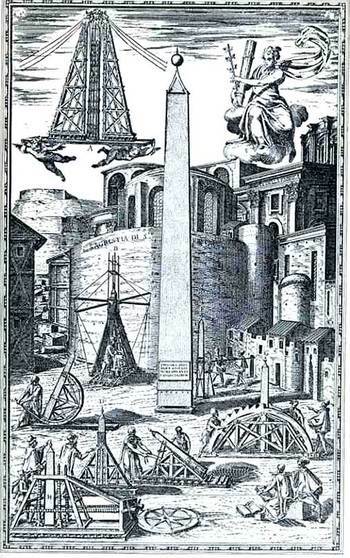 Domenico Fontana, in Rome, in 1743. This is the literal and absolute height of pre-modern, pre-mechanized building construction in the soaring Roman Baroque, ordained by “maestro”, the master, Zabaglia (1664-1750), a spectacular (and necessary) proponent of practical mechanics as applied to the building trades. Among the “Castles” and churches and bridges alluded to in the title of his book, Zabaglia was responsible for affecting the maintenance and repair of St. Peter’s (more particularly to the basilica and the vault)—specifically, he had to figure out how to get the workmen and materials into place, and into very difficult and very high places, without damaging or destroying any of the existing decoration, artwork, sculpture, frescoes, and so on. 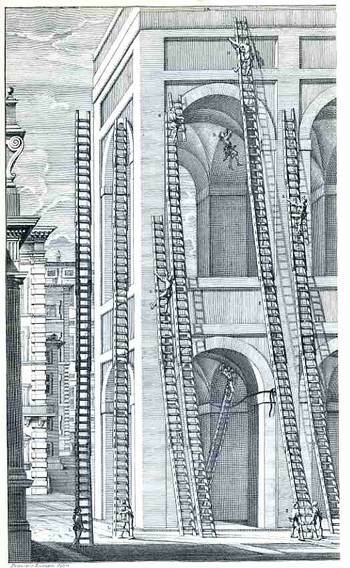 This was no easy feat to perform back there in the dim, 265+ years-ago pre-electric pre-power past, with enormous technical and operational difficulties, and Zabaglia accomplished this was superior affect, devising complex and elegant moving and stationary scaffolds, hoisting and holding mechanisms for the ladders, and much else. He did just beautiful work, and he is a patron saint in the history of repair. 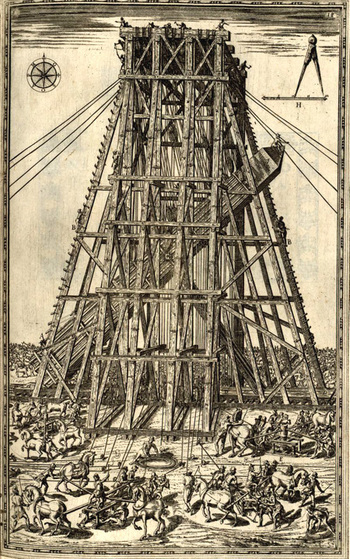 Ladders and scaffolds were important of course but were among the least of Zabaglia’s numerous accomplishments and inventions—they were so plentiful and useful that two Pope Benedicts ago (Pope Benedict the 14th) ordered their publication with actual teams of artists and engravers performing specific tasks. This second image pertains to the tail-end of the Zabaglia title-page—the moving of the 500,000-pound Egyptian (carved during the reign of Nebkaure Amenemhet II, 1992-1985 BCE, and originally standing in the Temple of the Sun at Heliopolis) obelisk in 1586 by Domenico Fontana, which was one of the greatest engineering feats of the Renaissance. Moving this enormous and relatively delicate object (from the Circus Nero, where it was placed by the emperor Caligula in 37 ACE, to St. Peter’s Piazza del Popolo, 50 years or so before it would be more enveloped by Bernini’s flying wings) took years of (very) careful planning and months of motion and movement, not to mention an extra month to get everything into place and slowly raise the obelisk into its final position. Fontana had to be cautious and correct, and he was, performing a not-so-minor miracle of pre-industrial magic to move the priceless 250-ton iconic relic and place it perfectly down in the center of Christianity. now that must have been one hot Roman summer, especially for Fontana. This is an unusual bird's-eye view of the Great Los Angeles area, the downtown area shown larger under a magnifying glass. It forms the central image of the cover of a pamphlet on the regional planning conference for L.A. County which took place in September 1912. I have not seen an image of the map online, and checking WorldCat I see that there is only one copy of the work located in libraries world wide (and this at Harvard), and so I'll share it here. The metal ring of the magnifier does have the appearance of a 20-story tall wall, but it really is part of the instrument. It reminds me too of a mirror, of the mirror of the other Alice, the one from Lewis Carroll's Through the Looking-Glass, and What Alice Found There (1871), where Alice steps through the looking glass--in this case what we see in this lookig glass is the L.A. of the future that the planners could see. I've put together several interesting graphs and maps displaying historic human life expectancies--perhaps they will be useful. I’m fond of images of trees, but mostly if they are forensic or employed to display relationships between ideas or data. One of my favorites for the former is this great image from Peter Guillet’s Timber Merchant's Guide. Also, a Table, Whereby, at One View, May Be Seen the Solid and Superficial Measure of Any Square or Unequal Hewed Logs or Plank...1 (printed in Baltimore by J. Longrove in 1823). Guillet was basically a tree dissector, a harvester of wood for the construction of naval ships. His book shows how to make the best—the most efficient—use of various varieties of trees, displaying how to employ different sections of trees for different parts of a ship. The book must’ve been an indispensable handbook down at the mill. At the every least, it certainly introduced a novel way of looking at trees. A "Mad King" entered the world's greatest telescope just before it was completed; 51 years later after a good life in the skies, children played inside of it in a garden, the telescope horizontal and asleep. Between those times William, Caroline, and John Herschel used it and the data it produced to perhaps the greatest end of any family that has ever worked in the field of astronomy. 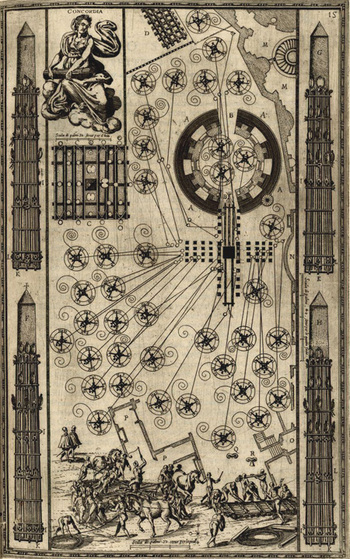 They were the great classifiers in astronomy, and their telescope, constructed between 1785 and 1789, 40' long and with 48" mirrors, was a contributor to that, and was the largest telescope in the world for about 50 years. Even though the telescope wasn't laid to rest until 1840, it stayed in use only until 1815, having come online in August 1789. Magnificent as the 40' was, there were certain problems with it, and occasionally the great bulk of the instrument worked against itself, and it sometimes proved less effective than smaller telescopes. The telescope was a result of some fantastic work by William Herschel (1738-1822), who built hundreds of superb instruments over his lifetime, and whose prodigious work lead to many discoveries, not the least of which was the discovery of Uranus, which was the first planet added to the night sky since antiquity and which (sky!) rocketed Herschel to international fame. (There were serious suggestions among the leading figures in astronomy that the planet be called "Herschel". The British Crown responded to the utter beauty of his work and offered funds to construct the great telescope. When it was nearly constructed King George III visited and stepped inside the tube of the great thing, stating something to the effect that it was the stairway to the stars. George III had a certain set of issues--well, it was all mostly issues, due to some physical malady that caused the poor King to live a very strange intellectual and interpersonal existence, bursting the known limits of "normalcy". But he was certainly correct in his appraisal of the telescope. George III survived his failure with the Colonies by 31, as well as the useful life of the telescope by five. I'm not sure how long he survived himself. Back to the children and the retirement of the telescope. It was about 25 years after the telescope drew its last useful breaths that John Herschel, William's son, decided to haul the iconic instrument down. He was concerned about the deterioration of the telescope, namely the wooden casing that was rotting around the metal tube--and the fear that the thing would collapse. A big, heavy, wood and metal 4' wide tube crashing down from its perch, possibly injuring his children. And so down it came. The wood casing came off, the mirrors came out, and the telescope was laid horizontally of wooden blocks in the garden--the "broad bright eye" was consigned to its final rest. There was a ceremony to the resting bequest of the telescope, and it reminded me not so much of funerary customs, but of memory more so than remembrance. It was to me more like the beautiful and simple Japanese monuments to lost and broken children's toys rather than burying something on a hill under a lonesome pine. The Herschel telescope, which figured to be one of the great and iconic images of telescopes (and perhaps astronomy?) in the history of science, was laid to rest with a family-and-friends ceremony at the Herschel's. Like the idea behind the Japanese monument to toys, and their memory and importance, whether the toys existed or not--the ceremony for each discriminated the importance of the object that made it more than the "thing" it started out to be. The ceremony elevated the object to the place it deserved to be, living or not. And there was a ceremony (on January 1, 1840) for the telescope: the Herschels and their seven children and the children's governesses and assorted friends who had known the telescope and William Herschel formed a procession that circled the telescope several times, after which the entire party entered it and sat on benches provided for the occasion. There were verses sung (reprinted below)--evidently to make as much noise in the old telescope as possible, after which the group exited, circled the instrument a few more times, at which point the open end of the telescope was sealed. May make the old telescope's echoes roar? Merrily, merrily, let us sing, an dmae the old telescope rattle and ring"
I found this lovely story in an issue of The Mirror of Literature, Amusement, and Instruction, for Saturday, April 25, 1840, page 281. It is interesting to note here that not long ago the BBC's "Stargazing Live" built a modern version of the 40'--using a sewer pipe. Out of the many references I've seen for war gaming in early-ish computer journals and reports from the RAND corp (and other such places before, say, 1962) I don't think I've ever since a direct visual connection between three-dimensional gaming objects and a computer. But here are two examples,in the same journal and within a few dozen pages of each other, one featuring chess pieces and the other featuring toy soldiers. Both are obvious selections, but not used very often at all in illustration. Games of war and capture go far back, with chess many hundreds of years old and Go older still. Early war games as "war games" appeared in the late 18th and early 19th century, developing past Strategoes (in the 1880's) with other iterations, and then famously in two mass culture works by H.G. Wells, Little Wars (1911) and Floor Games (1913). I haven't read anything in the Phrenological Journal before seeing this in American Agriculturalist for 1869, but the small (two inches tall) ad made an impression, what with the big head filled with text concerning all of these questionable sub-medical practices. It seems that the head in the image is big and very smooth and very unphrenologicalistic about it. The U.S. Strategic Bombing Survey was a massive intelligence operation composed of a 1000-person team. It attempted to establish the successes and failures of American bombing operations during WWII, resulting in a 208-volume set of findings for the war in Europe and another 108 volumes for the war in the Pacific. Atomic bombing was another matter. I am not going to address the effectiveness issues of different sorts of bombing here--it is a very large and complex issue, and just outside the scope of what I set down to down just now and the amount of time I have. What I did want to do was share this typed/manuscript material (below) that was kept by a member of the analytical team serving in the Pacific. It is interesting to see how the form of the final reports took shape from some of the original notes. Captives of Capitalism (printed ca. 1925) is a small pamphlet with a big reach. It was published by the Committee for International Workers Aid, a Communist organization created in Berlin in 1921 (as the International Arbeiter-Hilfe) to help raise money for famine and drought victims in Russia. It was evidently expanded to include collecting money to help victims and prisoner of Fascism, which seems to be the major target in this pamphlet. Although pretty slight the pamphlet looses no time in getting to the heart of the matter, detailing atrocities and unjust imprisonments by fascists and capitalists in Germany, Roumania, Bulgaria, Hungary, Lithuania, Finland, Lithuania, and Italy. Although not mentioning the United States the "Call to Action" states that "Democracy is on the rampage, with proletarians as its victims" with calls for unity of workers and donations to the International Workers Aid as well as to Red Aid--money to help "lighten the burden of the imprisoned" and to "support starving families". Inside of my copy of the pamphlet was a small handout, a long sheet folded into quarters with the working "title" of "Drop by Drop the Bucket Will Fill", and on opening the sheet the entire reverse is a form to fill in with the names of donors and amounts of the "drops" they send into the bucket. This request series in particular was aimed at "Xmas Relief"
of a proletarian fighter against capitalism creates a millionfold echo from the workers of the world." Unfortunately the Soviet Union would become its own home-made disaster following the turmoil and famine(s) of the early 'twenties. Lenin's death in 1924 led to Stalin, and Stalin went down a terrifically bad path, beginning his Five Year Plans in 1928 which would displace 25 million families to create the collective farm state; smashmouth industrialization lead to great gloom and the development of Stalin's cult-of-state created the Great Famine in '32-'33 and the rest of the hideousness that would cover the Soviet Union through the rest of Stalin's existence. This fine image comes from a small and scarce publication called The Kentucky Mountain Echo, a True Story of the Mountains, by Floyd D. Baker of Hazard, Kentucky, and printed in 1929. Hazard--a town of about 5,000 in Appalachians in the far eastern part of the state--was evidently fairly secluded given its position in the hills and relative inaccessibility. That changed when the railroad was introduced in 1912 and which introduced the town to the rest of the region, establishing a short-lived "boom" period which soon went 'bust" in the Depression. This fine picture of Americana comes from the neighboring Perry county ("Hazard" and "Perry" both being named so for Commodore Matthew Hazard Perry) and shows a victory of the local constabulary over a pair of Moonshiners--two Mountain Men trying to make ends meet, no doubt. It seems as though the area has some history in this department, a piece of it surfacing in very popular culture in a television show called The Dukes of Hazzard, supposedly loosely based on this area (though the producers added an extra "z" and placing it in Georgia to avoid any legal issues with the town). Another interesting story from this publication appears here in this blog, from the Alpha and Omega Department.